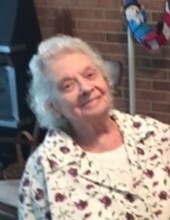 With her loving family by her side, Reba W. "Nanny" Bass, age 89, passed away peacefully at her home Wednesday afternoon, April 3, 2019. Nanny was preceded in death by her husband, William H. "Jack" Bass; son-in-law, Ricky Cobb, and grandson-in-law, Rod Jones. She leaves a lifetime of treasured memories for her daughters, Linda Bass Lancaster (John) of Temperance Hall, and Cathy Bass Cobb of Pinetops; grandchildren, Tammy Powell (Brent), J.E. Lancaster (Melissa), Mike Lancaster (Lisa), Heather Cobb Jones, and Jessica Cobb; great-grandchildren, Ashley and Alec Powell, Allison and Mallory Lancaster, Kaleb Lancaster, Riki Contino, Savanna Jones, Caleb Jones, and Jacob Anderson; special nieces, Sandra Bass and Betty Boswell; along with a host of family friends and extended relatives. Nanny’s life will be celebrated with a service at 2:30 pm, Monday, April 8 at Temperance Hall UMC. Burial will follow at Evergreen Memorial Gardens in Wilson. The family will receive friends Sunday evening, 6:00 – 8:00 pm at the church and other times at the homeplace.